We headed south for the Veterans’ Day weekend. Last time we were south of Rome on the mainland was in December 2011 when we spent a lovely week in Sorrento visiting sites from Naples to Pompeii, Ercolano and Amalfitown. 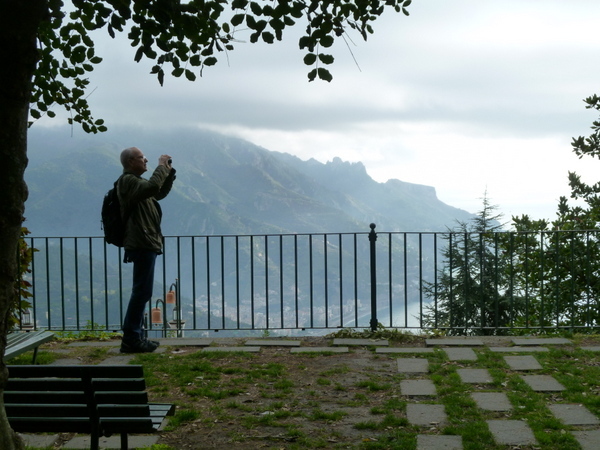 Ravello has been on my list for some time, and it seemed a good idea to hit the hiking paths of the Sorrentine Peninsula during the cooler weather of the off-season. The view from B&B Auditorium Rooms. As the week prior to travel progressed, it looked like we might be rained out. But the train tickets had been purchased and a B&B secured, so off we went on a gloriously sunny Friday. Ravello did not disappoint and the weather has been kind. 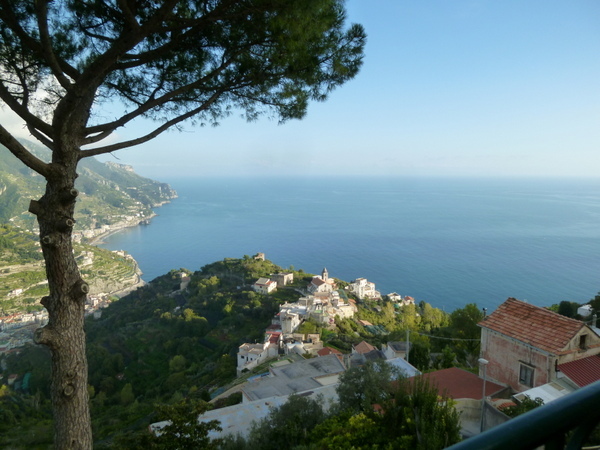 Our B&B overlooked the Bay of Salerno from a delightful east-facing balcony where we were able to eat freshly baked cornetti and ham-and-cheese toast kindly prepared by our hosts Marco & Pasquale. We’d have to walk a lot to amortize breakfast. 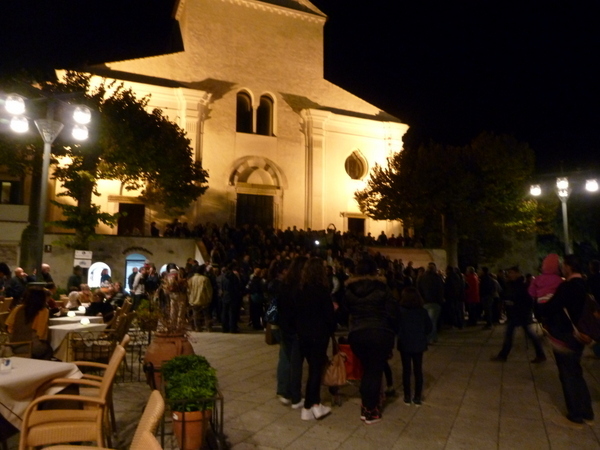 Friday evening was a fireworks contest between Japan and Italy, held in the gorge below Ravello, with the fireworks rocketing to a height easily visible from the Piazza del Duomo. 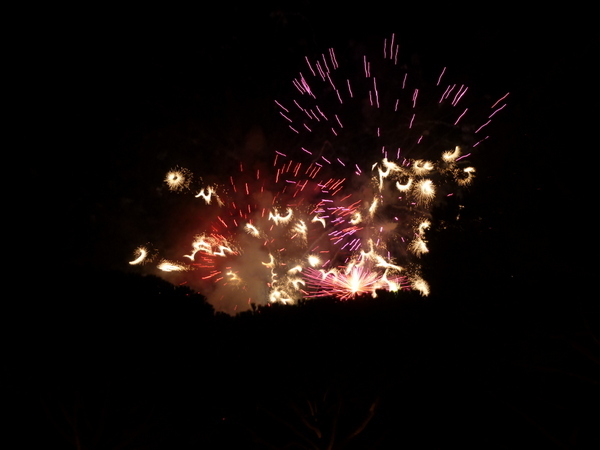 There, ensconced with glasses of good red wine, we joined the locals and enjoyed the spectacle of two 3-minute shows before heading off to dinner at a cliffside restaurant overlooking the bay. What luck to arrive the evening if such an event! Gathering for fireworks contest, Italy vs Japan. 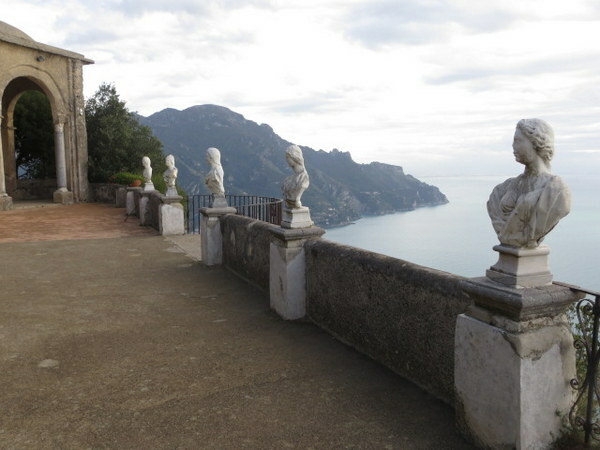 There is an amazing variety of surfaces in this network of trails around Ravello. this one of stones set in concrete with retaining walls. Far more sophisticated than the Cinque Terre. 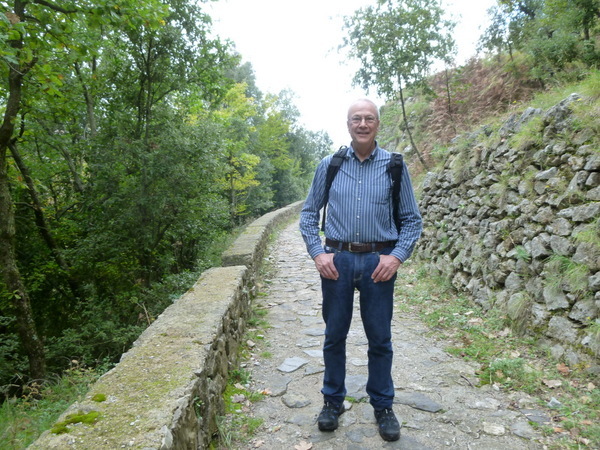 I had hoped to hike the Sentiero degli Dei, but it would have required a couple of buses to achieve the start of the trail, four hours of walking, and an additional two buses to return. As I am nursing a bum knee (possible torn meniscus and under care of a physical therapist) we opted for a shorter hike with no buses, thinking it would be a shorter journey. Ha! 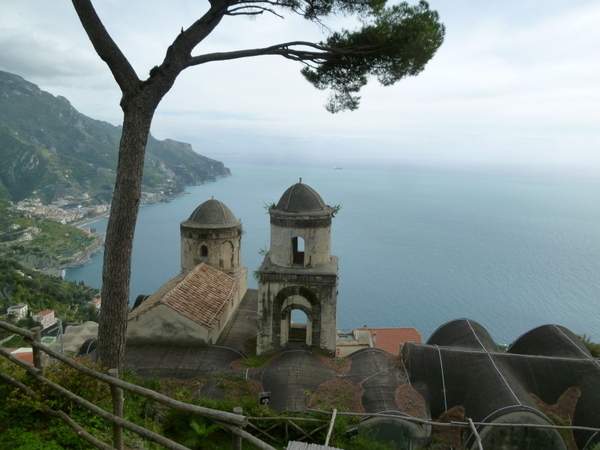 It turned out to be an arduous hike between five small towns: Ravello, Santa Caterina, Campidoglio, Minuta and Pontone. We were the ONLY PEOPLE hiking this path on a Saturday, testament to the fact that the tourist season had passed. Photographer on the edge. Beautiful vista over the Mediterranean. 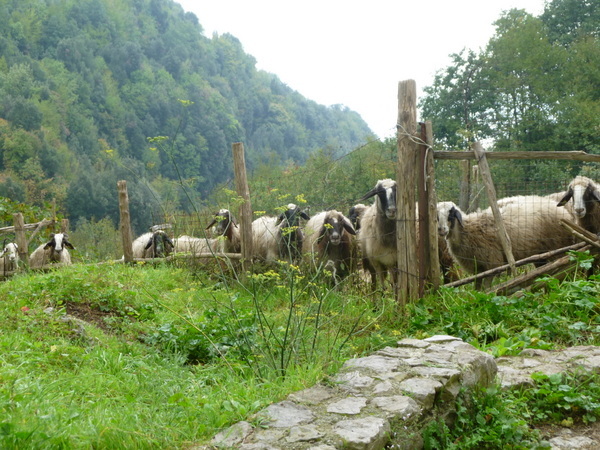 These sheep along our trail eyed us suspiciously. Decision point – we chose incorrectly and went left for 20 HARD minutes down through the forest. thinking the trail the book depicted had fallen into disuse. (The book said “Where the pavement ends take the dirt path on the left.” It said nothing about the staircase to the right, which was the correct way.) Luckily we decided to ascend said staircase to see where we were and picked up the rightful trail, one with mush easier going. We’ve encountered many un-groomed trails in Italy. This one had parts that were almost too good to be true! 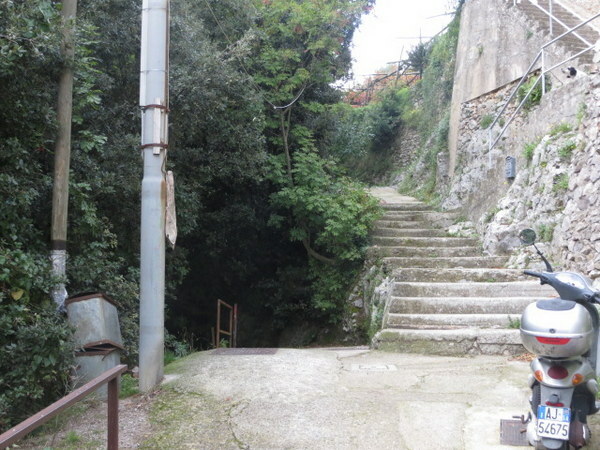 Contrary to the ruggedness of the Cinque Terre, parts of this trail were stone embedded in concrete with retaining walls. But oh-my-God there were stairs! 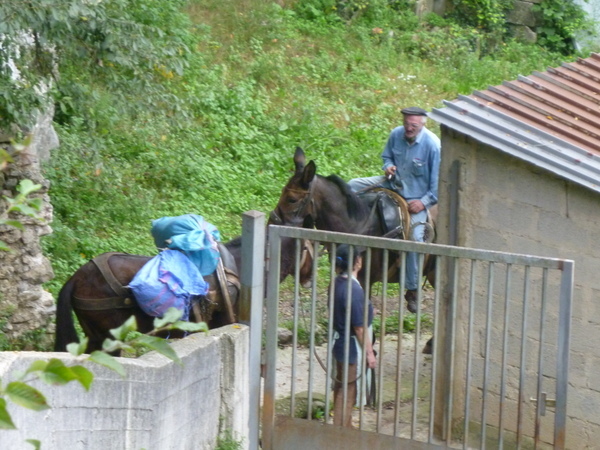 Farmers use horses and mules to carry products and supplies on the network of paths. 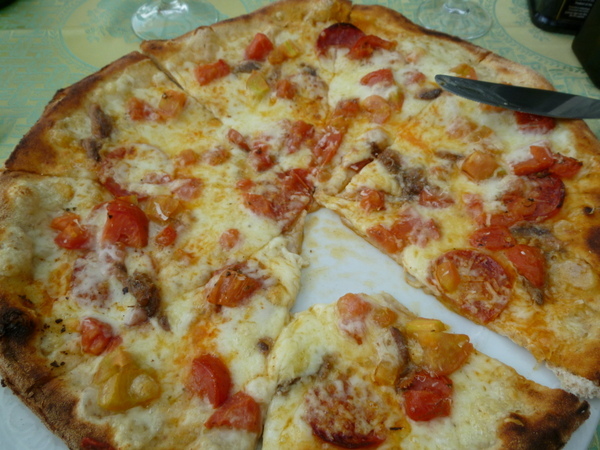 Italians usually do not eat pizza for lunch. We have no such reluctance. This one with tomatoes, spicy salami, anchovies, mozzarella and pecorino. We were the first visitors this day. No one else arrived until we were leaving. again! 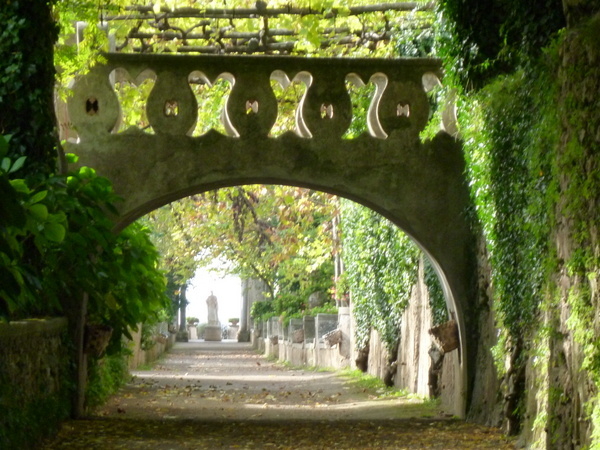 Ravello is blessed with two beautiful villas and lots of charming alleyways (and stairs!). 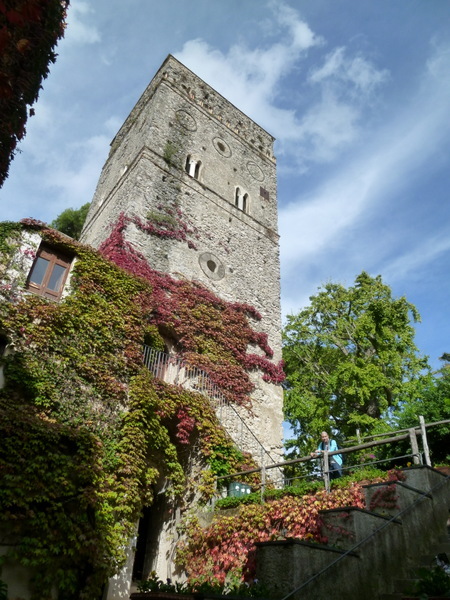 We set off for Villa Cimbrone where we meandered completely alone for an hour-and-a half. This is a remarkable property. An estate dating to the 11th century, fallen into disuse and decay, restored in the early 20th century by an English nobleman who had more money than God. It is truly lovely. In addition to being open to the public, it is an ultra-exclusive hotel, booked up for months in advance despite the high prices. This was called the crypt….not sure why. Magnificent vaulted arches. Villa Cimbrone. 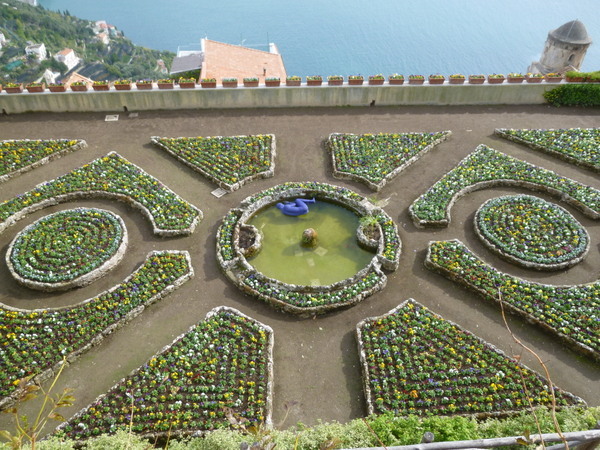 Infinity Terrace at Villa Cimbrone. A little overcast but no rain. Much of Villa Rufolo is lost to the ages. This tower dominates the remains. After a restorative double espresso in the Piazza, we tackled the smaller but lovely Villa Rufolo. 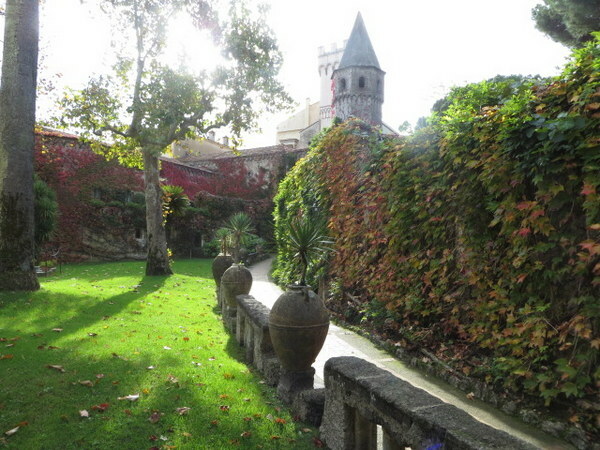 This one dating to the 13th century, where it was once of such an impressive size, it was said to have “more rooms than days in the year.” Here we found magnificent sea views, ancient ruins, gardens, and a weird purple man floating in a pond. After, we ate a nice lunch of seafood and fresh vegetables in the company of two very vocal cats. Note the purple man, floating in the pool in a garden of pansies. Iconic Ravello view from Villa Rufolo. In a place where land is scarce, gardens are strung along hillsides in tiny plots. Ingenuity! 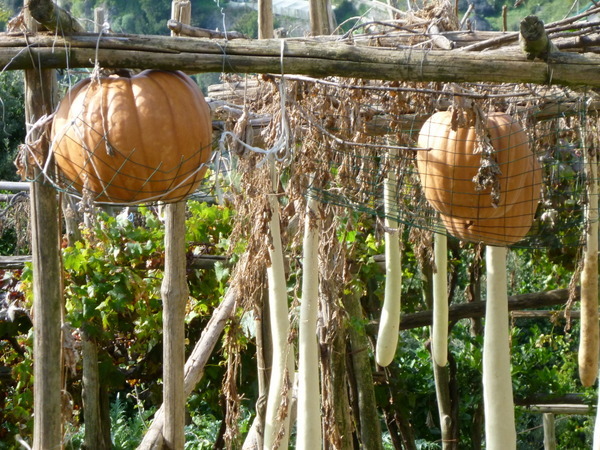 Pumpkin vines and other squash are hung from lattices and caught in netting to prevent falling. ← La Festa di Halloween: “Dolcetto o Scherzetto”! 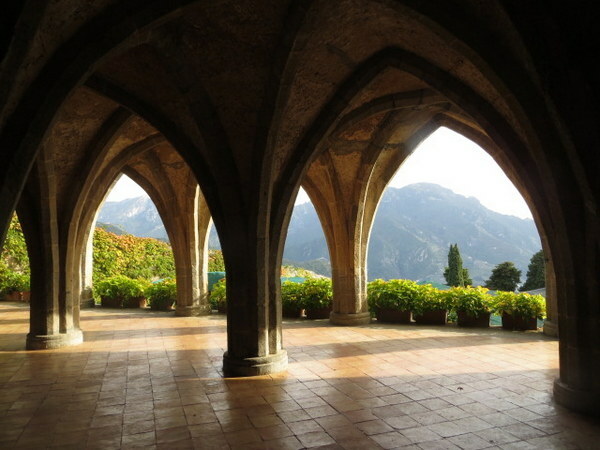 You covered Ravello so well. Loved the photos. Ravishing, indeed! Thanks for another lovely adventure… we live vicariously through you. Soon you will live it with us… at least for awhile! Oh Laurel, your postings are such a delight to read! What a beautiful country! You’re making me think I should travel there next instead of Spain! You can speak Spanish here and be understood. 🙂 What are you waiting for? Nice to hear from you, BTW! Absolutely lovely. What a great trip, hike, scenery and oh, the food. I almost ate my phone looking at the pizza. Love to you both. LOL! I almost dropped my phone when I read your comment! With love from Rome to LA! Thank you for sharing all of your amazing adventures. I like that you travel in the off season and your amazing observations! Ciao Sharon! You certainly miss some things off-season, but mostly the advantages outweigh. Thanks for the “virtual vacation”. All the pics are just beautiful, as usual. I enjoy reading about your little excursions. They make me feel I am on vacation too. I love the pictures especially the picture of the pumpkins and squash. I look forward to your next article. Thank you Mary. I have a piece in the works about Villa D’Este, near Rome. Soon, I hope! Have enjoyed your blog from the beginning! Feel somewhat a kindred spirit, as we spent five amazing ex-pat years in Bonn. Italy is my favorite country to visit, and there are places in the far south I still want to explore. If you wouldn’t mind, I would love to ask your opinions on a few, especially about off-season travel. Delighted to hear from you and would be happy to consult on travel. Write to me anytime!